Photographer Jason Hawkes posts a selection of aerial photographs he's taken over the years. Very mellowness-inducing! No one knows for certain exactly where or when the tea plant, Camelia sinensis, originated, or even when or by whom it was first domesticated. What is known is that the tree evolved somewhere in the jungles of the eastern Himalayas, where in an amazingly rapid evolutionary development, the great varieties in temperature and micro-climate caused by the mountains rising from tropical lowlands, combined with the heaviest rainfall in the world as the monsoon clouds hit the outlying Himalayas, made it the most varied and rich region for plants in the world. It seems likely that parts of the tea tree were first chewed by monkeys and other mammals indigenous to this region. Homo sapiens spread into the area between sixty and a hundred thousands years ago, and, perhaps taking their cue from the monkeys, early tribesmen began chewing tea and found it to be stimulating and relaxing to mind and body. It helped when carrying out arduous tasks, such as tramping through jungles and up mountainsides; indeed, people still chew tea leaves for this purpose: in Turkistan, for example, as Serena Hardy writes in The Tea Book, they chew used tea leaves, which "helps to allay fatigue on a journey when food is scarce." See a previous post about this book here. Recently I came across this page about women pirates who were less well known than their male counterparts. Confessions of a Yakuza. In the mid-1920s, the protagonist, a Japanese yakuza, was drafted and sent to Manchuria, China—which Japan had invaded after its victory in the Russo-Japanese War of 1904-05. On page 122 of the book, he mentions a female bandit there named "Okiku of Manchuria." The place [Manchuria] was crawling with warlords, bandits, and so on, who did more or less what they liked—I mean, there wasn't any proper government, so it was every man for himself, and a lot of people who couldn't make a living in Japan drifted over there hoping to get rich. A fair number of them became bandits, apparently. There was a woman called "Okiku of Manchuria," for instance—she was one of the best known—who was supposed to be a force to reckon with there, with at least five thousand followers of her own. The brief summary of the chapter of the book dedicated to Okiku of Manchuria says only that she was "sold from Amakusa (in Kumamoto, Japan) to Korea, became a bandit in Manchuria, and eventually drifted to Siberia." Sounds like a fascinating story. Being intrigued by obscure figures in history, I may just have to get this book. A study conducted at the University of Washington suggests that green tea may help prevent lung cancer, although the researchers conclude that "[f]uture studies are needed to determine how green tea affects the genes associated with cell cycle regulation and apoptosis during the mouse lung carcinogenesis process." 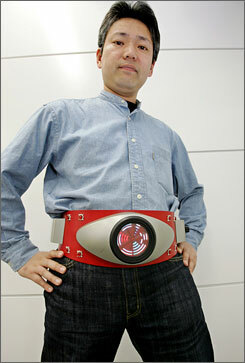 A Japanese toy manufacturer has released a reproduction of a belt worn by the hero in the 1970s TV show Kamen Rider ("Masked Rider"). The belt is being marketed to middle-aged men who watched the show as kids. What's the difference between the kids' version and the adult version, you ask? Why, the waist size, of course! New research suggests that taking vitamin B-12 could make seasonal allergies a thing of the past. Possible side effects include unstoppable immune function, sharper mental focus, and boundless energy. Police in Japan recently arrested a 70-year-old man after he threatened convenience-store clerks with a chainsaw. The man had been browsing magazines for 3 hours when the manager finally asked him to either buy something or leave. He chose the latter, but then showed up soon after with a running chainsaw. Fortunately no one was hurt. Apparently, the man was a fixture at the convenient store, coming in to browse magazines in marathon sessions on a daily basis. Anyone who's been to Japan has surely seen the throngs of non-buying browsers at bookstores and magazine racks. I've always wondered why the booksellers are so patient with them, allowing them to browse to their heart's content instead of chasing them away. Tea is set to dethrone coffee as America's beverage of choice. For health, for taste, for enjoyment, tea is catching on. This video clip from a Japanese TV show demonstrates how to make an ordinary adhesive bandage (Band Aid) stay on longer, especially when applied to a finger. The audio is in Japanese, but the step-by-step visuals are fairly self-explanatory. The reason that this trick is effective is that the adhesive strips form a tighter seal around the finger, keeping out the water that would ordinarily seep in and weaken the adhesive. The operation borrowed a procedure called deep brain stimulation, or D.B.S., which is used to treat Parkinson's. It involves planting electrodes in a region near the center of the brain called Area 25 and sending in a steady stream of low voltage from a pacemaker in the chest. Speaking of insomnia, here are a few more commonsense tips for beating it naturally. NASA's Jet Propulsion Laboratory has a Flash slideshow titled "Year in Images: 2005." Pretty cool. My only gripe: There's no pause button. After the slideshow, you're taken to a gallery of the same images. Here is an article about experimenting with various lifestyle changes to overcome insomnia without relying on drugs. The first example in the article is about a woman who, at the suggestion of a friend, cut out coffee in the afternoon. As soon as she did, she started sleeping like a baby. As a way to reduce your caffeine intake, switching to green tea is a healthy alternative to going cold turkey. Not only does green tea have only about one-third to one-quarter the caffeine of coffee, but the antioxidants in green tea slow the body's uptake of caffeine. This assures a more constant level of caffeine in the bloodstream, avoiding the jolt-and-crash changes associated with coffee. The Washington Post has a movie of the 2006 Cherry Blossom Festival, including an exhibition bout by members of the American Sumo Association. 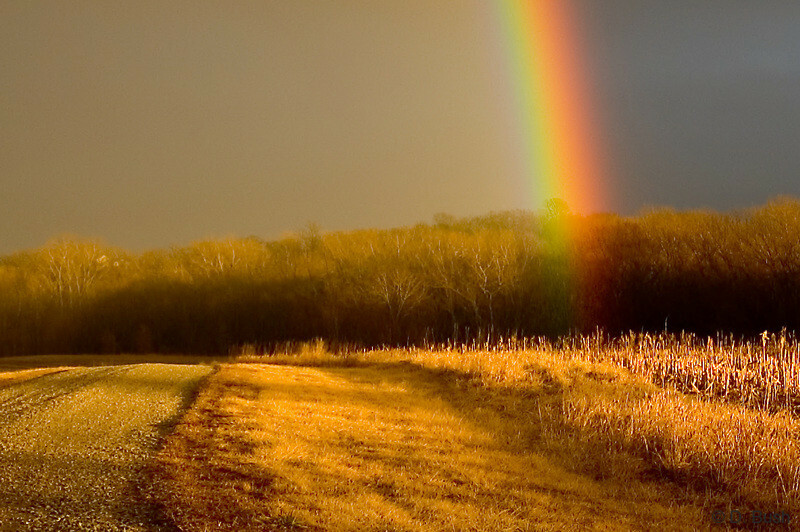 Check out these rainbow pictures. Pretty cool! Here's another excerpt from Green Gold: The Empire of Tea . Here, the author writes about how foreign trade flows explain the great imbalance in the adoption of tea drinking in the 17th and 18th centuries between the British, who took to tea like a fish takes to water, and the Germans, Italians, and other Western Europeans who ended up incorporating coffee into their culture instead. Flight attendants will insist that they are merely ensuring public safety and the smooth performance of whatever corporation they work for. Still, they may have more power over you, more legal right to limit your movement, than anyone else you'll ever encounter. You'd have roomier quarters and a better range of entertainment in a small-town jail cell on a Sunday night. An airplane is an almost perfect device for torture; and so you arrive at your destination, not just tired but insane. Speaking of meditation, Beliefnet.com has a 10-minute guided meditation session that you can do online, with an accompanying slideshow. 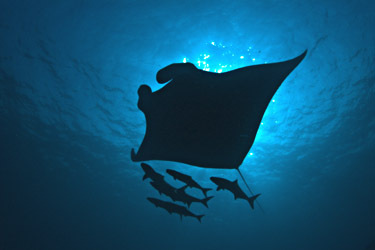 The winning entries in Smithsonian magazine's 3rd annual photography contest are viewable online. One of the categories is travel. 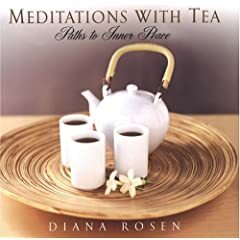 Another book on tea I've been reading is Diana Rosen's Meditations With Tea: Paths to Inner Peace , which, true to the title, is literally about using tea as the centerpiece of a relaxing, mellowness-inducing meditation experience. In the beginning, on the advice and counsel of a friend, I began to sit quietly each day and "not think." The first day I lasted about a minute. The rattle-rattle in my head of deafening. The next day, I lasted a minute again. I could not let go of the fear that if I was still and let myself be at rest there would be nothing there. Or, there would be things I did not want to know or be reminded about. The fear was so intense, I abandoned the practice for weeks until my friend said, "Just try again." Imagine light or dark, he advised; invite good feelings, love, God, whatever you want, to pour into your being and go to that place of stillness that can quiet the mind completely. It's interesting that sometimes the first thing to be overcome in achieving this deep relaxation is the fear of being alone with our thoughts. I'll be posting more excerpts from this very intriguing book. Stay tuned! Japan's toilet manufacturer Toto has built a factory in Mexico to keep up with growing demand in the U.S. for its high-end (no pun intended) toilets with built-in bidet features. 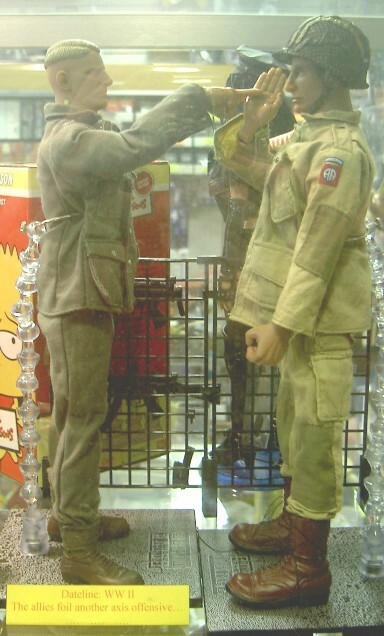 I took this photo of a display in the front window of a hobby shop at San Francisco Japantown. The caption reads: "Dateline WWII: The allies foil another axis offensive." They thought you'd never see these commercials here in America, but the Internet is making it possible. Japander.com (a play on the words "Japan" and "pander," as in to hawk) is a veritable database of past commercials that American celebrities have done in Japan. However, new "entries" in this database are likely to be scarcer than before: As mentioned in a previous post, American celebrities aren't as sought after by Japan advertisers as they were in the '80s or '90s. Running/jogging magazine Time to Run has a list of the 10 worst foods you can eat. Topping the list is of course ... Oh, why spoil the surprise. A new niche in the Japan's service industry is arising: the ear-dewaxing salon. It's a place where you pay about $4 for a 10-minute ear-cleaning session. You can even view the inside of your own ear via the tiny camera mounted to the technician's high-tech ear pick. The concept behind the new establishments is to give people the pleasant feeling some had as children when they would rest their heads on their mothers' laps and have their ears cleaned. Here is a brief Wikipedia entry on ear-picking in Japan. Obviously, they've never heard of Mellow Monk. You can read about Mellow Monk's growers here. These same reasons explain green tea's growing (or, depending on where you are, continued) popularity today—for green tea is simply Camellia sinensis leaves in their least-processed form. Stewart Elliott, a nursing home resident, writes the column "Notes From a Nursing Home." Here is a piece titled "Happiness finds us when we're not looking for it." The growing popularity in Japan of "brain training for seniors" reflects that country's aging society. The trend began in Japan's bookstores, with workbooks full of math, geography, and other problems for seniors to solve as a way to stimulate their brains and stave off dementia. Now, video game makers are getting into the act, releasing "brain training" titles marketed specifically to seniors. Nintendo has sold a combined total of more than 3.3 million of its “Brain Training for Adults” released in May 2005 and a sequel that came out last December. Its portable DS consoles on which the games are played are constantly out of stock in shops. As the aging of Japan accelerates, and seniors account for a larger and larger portion of the total population, companies will market more products to the sixty-and-older crowd. American could see a similar trend play out as our own Baby Boom generation continues aging. Photographer Gil Azouri posts some of his beautiful travel photographs online, including a gallery of photos taken in China. Yesterday, the slow sinking of the Philippine-registered cargo ship Eastern Challenger in Tokyo Bay was broadcast live on Japanese TV [link to video clip on BBC News]. All crew members were safely rescued from the 6,000-ton ship, which began taking on water after colliding with the Tsugaru-maru, a 500-ton Japanese vessel, in thick fog at 5:20 a.m. These photos are perfect for mellowing out to during a Mellow Monk green tea break! Here is a story about a mocktail bar in India where the menu includes concoctions made with green tea. A Japanese castaway was the first of his people to visit the United States. Another castaway rescued at sea by American sailors eventually returned to Japan to play a key role in the overthrow of the Shogun, which began Japan's modernization. First, there was Yamamoto Otokichi, whose storm-ravaged ship landed on the Oregon coast in 1834 after drifting across the Pacific Ocean for 14 months. He was followed several years later by Nakahama Manjiro, another shipwreck survivor who was rescued by an American whaling ship in 1841. He was taken to the United States, where the 14-year-old received a high-school education. He eventually returned to Japan, where Manjiro's knowledge of Western technology and the English language was put to good use by the rebels who orchestrated the overthrow of the Shogun in the 1860s. Wouldn't these castaways' stories make a good subject for a documentary? Or at least a term paper. The American Psychological Association website has an extensive page on anger management. As someone said, people don't make us angry; we let them make us angry. [To deal with anger, it's] best to find out what it is that triggers your anger, and then to develop strategies to keep those triggers from tipping you over the edge. To the above list, add one important omission: green tea. Not only does the natural theanine in green tea promote relaxation, but the "ritual" of preparing and slowly sipping a cup of hot green tea is a great way to take a step back and get your mind off whatever is bothering you. And when you're drinking that cup of green tea, feel free to play your favorite CD and put your feet up on your desk! The good news: People with high blood pressure can reduce their blood pressure and keep it low through simultaneous changes in lifestyle. The bad news: Simultaneous changes in lifestyle are necessary. In Autoweek.com, a former GM engineer who job-hopped over to Honda R&D Americas talks about the difference in decision-making processes at the two automakers. Very revealing. Shinto is Japan's native religion, tracing its origins to animistic beliefs and rituals of Japan's prehistory. At some point in ancient times, when Japan's ruling class decided to declare its leader to be an emperor of divine origin—chosen by the gods to lead and protect the land—the religion now known as Shinto was revised accordingly. In short, Shinto became the state religion, justifying the Emperor's status just as the Roman gods justified the power of that empire's leader. In the 12th century, however, the military took over the reins of power from the Emperor. The usurping generalissimo took on the title of Shogun, and the shogunate was born. The trouble was, the Shinto tradition didn't say anything about a Shogun. So the Shogun declared that he derived his power from the now-powerless Emperor, who was "consulted" on important matters. Officially, he could say yea or nay to important shogunate decisions, but in reality, the Shogun held all the power. Fast forward about 700 years. In the late 1800s, the Shogun was overthrown by a coalition of clans who had grown weary of what essentially was rule of the country by and for the Shogun's own clan, the Tokugawas. The principal "high ideal" under which the anti-shogunate forces rallied support was the restoration of Japan's emperor to true political power. Once the Shogun was overthrown, there was a brief but unnerving period during which people feared widespread social breakdown. In response, the new rulers further ramped up the "divine Emperor" rhetoric to make him an even stronger symbol of national unity. Again, the Shinto religion was called on to help out. Thus the renewed importance of Shinto to the state. These historical factors help explain the continued vibrancy of Shinto and the importance of Japan's royal family in today's Japan. Readers of CNN.com recently shared their weight-loss tips. I'm surprised the list doesn't include switching from coffee to green tea, as Nicholas Perricone and other have recommended. East Japan Railways showed reporters the prototype of its next-generation bullet train. If the new train hits its planned operating speed of 224 miles per hour, it will be the world's fastest train—in terms of normal operating speed. Currently, France's TGV ordinarily runs at a slower speed (186 mph) but will still be the record-holder when it comes to flat-out top speed (320 mph). It's not known whether Japan Railways will try to top that record. To the list of the Top 10 announcements you don't want to hear on the bullet train, add: "Ladies and gentlemen, we are about to try to break the current world record for train speed." As more and more hardworking folks in Japan are taking work home on their laptops, a virus in a popular Napster-like file-sharing program is releasing important data onto the Internet. Don't procrastinate—read this article now. Origami artist Robert J. Lang has photos online of some of his amazing origami creations. Masashi Yamaguchi writes about Japan's cherry-blossom culture. This page discusses dietary factors that contribute to stress. However, the author of the text fails to mention green tea and the two very important ways in which it can help reduce stress. First, not only does green tea have less caffeine (which in excessive amounts can contribute to stress) than coffee, but the antioxidants in green tea also coat the caffeine molecules in certain ways that slow the uptake of caffeine into the body. Slow uptake means a gentler boost, whereas with coffee, which lacks these antioxidants, the caffeine level in the blood first spikes and then drops suddenly as the body works overtime to break down all that caffeine. These sudden changes in blood levels of caffeine are responsible for the jolt and crash associated with drinking lots of caffeinated coffee. Second, green tea is rich in theanine, which promotes relaxation by increasing the level of gamma-aminobutyric acid in the body and by increasing alpha-wave production in the brain, for instance. The National Park Service has a Washington, D.C. cherry blossom site with information for folks wanting to view the area's blossoms. There's even a live webcam. Most of the trees were a gift from Japan in 1912 or were grafted from those original trees. There's a page on the trees' history here. 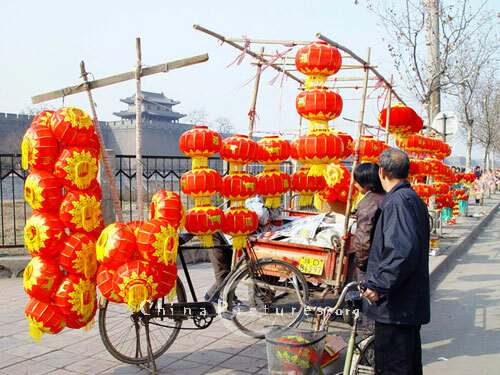 ChinaPictures.org is a site chock full of—you guessed it—pictures of China. There are hundreds of pictures, all organized by topic. One topic is festivals, an example of which is shown below. Japan is in the midst of cherry-blossom viewing season. There are scores of parks, gardens, and even tree-lined streets that draw large crowds when the cherry trees are in full bloom. One such garden is Rokugien, where some of the magnificient trees are illuminated at night, like the drooping cherry tree in the photo below.